The Virginian Lynchburg, Curio Collection by Hilton first opened as The Virginian in April 1913. Verus T. Ritter of architecture partnership Ritter & Shay, designed the five-story Classical Revival hotel. 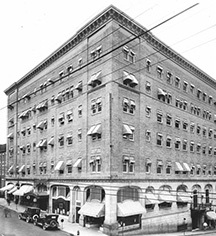 Architect Stanhope S. Johnson designed two additions to the hotel: in 1927 the sixth floor was added, and in 1929 the six-story north wing was added. Ornate features such as the arched windows on the first floor have been carefully preserved through today, while others such as the lobby’s 30 foot barrel vaulted ceilings, majestic marble staircase, wrought iron banister, and curved skylights were carefully restored in 2017. 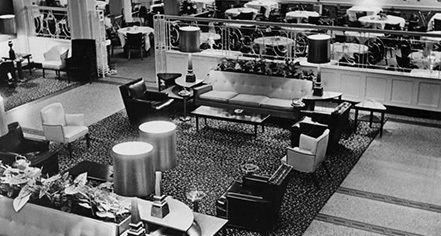 During its years of popularity and prosperity, the hotel hosted glamorous public and private events. Downtown Lynchburg and the hotel struggled in the 1960s, with the hotel ultimately closing. After being auctioned off in 1969, it was converted to the Stewart Arms Hotel. Liberty Baptist College, now Liberty University, bought the hotel and transformed it into their first dorm in 1972. It was a part of the university until 1981. In 1983, the upper floors of the building were renovated into low income housing using Section 8 funding. The renovations resulted in the elegant first floor being enclosed and used for storage.